The G 2900 X was developed to offer strong cleaning performance that is both easy to use and store. 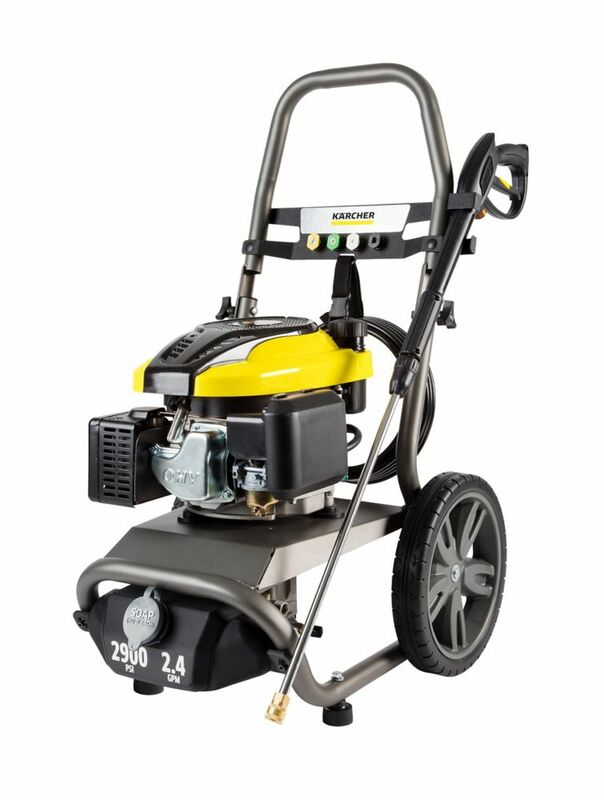 This gas pressure washer delivers 2900 PSI of TruPRESSURE, ensuring you get the highest level of cleaning power. The G 2900 X is powered by the performance driven Karcher KPS 196 cc engine with auto choke for easy starting; just pull and clean. This easy to start pressure washer is backed by a 3 year engine and 2 year pump warranty. This was designed with the user in mind with features like one-half gallon removable detgent tank, four spray nozzles to get the job done right, oversized 12 inch wheels, onboard accessory storage, and easy access to all hose connections. The rugged, all welded, steel frame design alows for easy start up out of the box; no tools required for assembly and can be set up in five minutes. Universal quick-connect nozzles and standard M22 hose connections simplify nozzle and accessory usage. Easy 5 minute setup no tools required. Driven by a powerful Honda GX200 engine, the G 3500 OHT is the perfect work companion for contractors and demanding users. Equipped with a three piston crankshaft (triplex) pump with professional-grade unloader valve, this unit can handle the largest and most challenging cleaning assignments. Pros will appreciate the 25ft steel-braided rubber high pressure hose, pneumatic tires with metal wheels and durable welded frame. Includes the patent-pending VersaGRIP spray gun. Quick Connect for easy set up and storage. Karchers 1600 PSI K2 pressure washer with Car & Home Kit makes quick work of cleaning the car or large surface areas. Make your car shine with the foaming nozzle and soft bristle brush, or switch to the surface cleaner for that larger deck task. The Vario spray wand allows for quick adjustment between low and high pressure without the need to switch nozzles. For stubborn stains, the patented Dirtblaster<sup></sup> spray wand will clean up the toughest chores. G 2900 X 2900 PSI 9 LPM Gas Pressure Washer The G 2900 X was developed to offer strong cleaning performance that is both easy to use and store. This gas pressure washer delivers 2900 PSI of TruPRESSURE, ensuring you get the highest level of cleaning power. The G 2900 X is powered by the performance driven Karcher KPS 196 cc engine with auto choke for easy starting; just pull and clean. This easy to start pressure washer is backed by a 3 year engine and 2 year pump warranty. This was designed with the user in mind with features like one-half gallon removable detgent tank, four spray nozzles to get the job done right, oversized 12 inch wheels, onboard accessory storage, and easy access to all hose connections. The rugged, all welded, steel frame design alows for easy start up out of the box; no tools required for assembly and can be set up in five minutes. Universal quick-connect nozzles and standard M22 hose connections simplify nozzle and accessory usage.